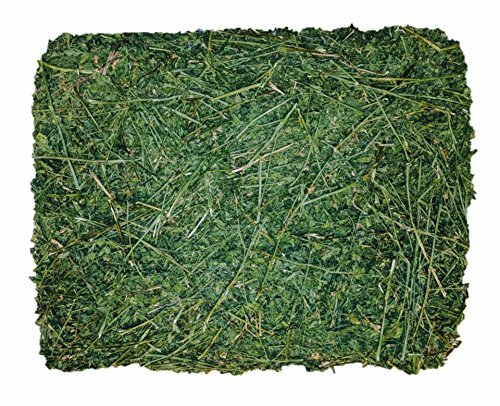 PERFECTION YOU CAN SEE: If you are looking for the absolute best quality alfalfa for your pet and don't want to worry about mold, weeds, or other contaminants, you've found the right product. This isn't a bunch of twigs and hay dust and that's shoved in a box by some employee at a corporate farm. I grow, harvest, and carefully inspect each flake of alfalfa from one of my certified bales and carefully package it to ensure that you get the greenest, purest, and leafiest alfalfa possible. This is directly from the hands of a 5th generation farmer to the mouths of your pet and no other alfalfa product on Amazon can provide that. QUALITY YOU CAN MEASURE: I use soil samples to properly fertilize my fields, cure my alfalfa to perfection with moisture meters, monitor the quality of my hay with lab results, and certify my hay to meet the highest standards from the Bureau of Land Management, US Forest Service, and North American Invasive Species Management Association. This attention to detail ensures you have the highest quality hay available. STANDARDS YOU CAN TRUST: I am an active member of the National Alfalfa and Forage Alliance, Idaho Hay and Forage Association, California Alfalfa and Forage Association, and Utah Century Farm and Ranch Association. This allows me to regularly attend seminars to find new ways to innovate and improve my product. FOOD YOUR PET WILL LOVE: If you have a rabbit, chinchilla, or guinea pig, they will absolutely love this hay. I also have local customers who feed my alfalfa to their horses, goats, cattle, and sheep and refuse to buy from anyone else because I have picture-perfect fields, the greenest hay they've ever seen, and their animals can't get enough of it. Support your local farmers and see why my hay is a cut above the competition. DIRECT FROM A SMALL FARMER: I grow, harvest, and package the hay with my own two hands while other listings come from corporate farms or hay buyers. CERTIFIED CONSISTENT QUALITY: with multiple weed-free certifications, you can buy with confidence knowing you will get supreme quality every time. LAB TESTED, FARMER APPROVED: I have the only listing with comprehensive lab results because other sellers can't measure up to my standards. ALL NATURAL, PURE ALFALFA HAY: I fertilize, nourish, and sun cure my forage without any additives, preservatives, pesticides, or GMO products. 100% SATISFACTION GUARANTEED: My attention to detail ensures you buy the finest hay that your rabbit, guinea pig, or chinchilla will love. If you have any questions about this product by Viking Farmer, contact us by completing and submitting the form below. If you are looking for a specif part number, please include it with your message.